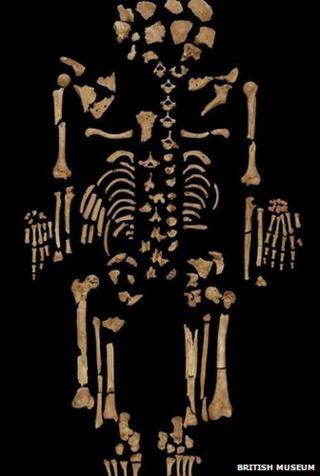 Image caption The skeleton of a young man who suffered from cancer more than 3,000 years ago. Researchers have discovered the earliest confirmed case of cancer in a young man who lived in ancient Egypt. The discovery of a diseased skeleton dating back to around 1,200 BC was made at the Amara West site in northern Sudan. The new finding suggests that the disease has its roots in the distant past. Details of the skeleton have been published in the Journal PLOS ONE. The skeleton was discovered by Michaela Binder, a PhD student at Durham University. She said the find was of "critical importance in learning about the underlying causes of cancer in ancient populations, before the onset of modern lifestyles". Cancer is thought of as a modern-day disease, spurred on by smoking, unhealthy lifestyles and the stresses of day-to-day living. Ms Binder's discovery suggests that the disease was prevalent thousands of years ago. "I was surprised to see such a cancer in an individual from ancient Egyptian times," she told BBC News. "We still don't know a lot about cancer. Only a very few examples have been found of the disease in the distant past." Ms Binder's finding is of particular interest because it is 2,000 years older than the previously confirmed instance of the disease. When she unearthed the skeleton she found that the bones were riddled with holes. She worked with Daniel Antoine, a curator at the British Museum, who is responsible for the museum's human remains. "It was very exciting to work with such a well preserved skeleton," he told BBC News. "The marks on the bones were very clear and our analysis showed that there was evidence that the young man suffered from a type of cancer." The discovery will be of great interest to medical researchers, according to Dr Kat Arney of Cancer Research UK. "If they can analyse the DNA from the skeleton, it might tell us about the gene mutations that made [this person] susceptible to this type of cancer. That could shed light on the evolution of the disease, along with the evolution of humankind." There have been some previous hints of the disease in archaeological records. Last year, a US researcher published details of a 120,000-year-old fossilised Neanderthal rib that showed indications of a bone tumour. There have been other finds from around 4,000 years back that show some similar signs. But without a full skeleton to show the spread of the disease, it is hard to confirm that these specimens actually had cancer.